Jumeirah, a Dubai-based luxury hotel chain with properties in Europe, the Middle East and the Far East, has been defining innovation for years, while still keeping its historic hotels true to their nature. That couldn’t be more evident than with Burj Al Arab in Dubai and Pera Palace Hotel Jumeirah in Istanbul. I was able to sit down with Burj Al Arab General Manager Heinrich Morio and Pera Palace Hotel Jumeirah General Manager Pinar Timer recently at Four Seasons Hotel Los Angeles at Beverly Hills. We talked about the latest developments at each hotel, what Morio and Timer were striving to accomplish and what the future holds for the highly praised properties. So, without further ado, here’s a look at both luxury hotels. Burj Al Arab was named a 2014 TripAdvisor Travelers’ Choice Award winner in three different categories in the United Arab Emirates: romance, luxury and top hotels. First of all, Burj Al Arab’s design truly stands out from the rest. It is designed to look like an Arabian “dhow” sail and it’s widely considered to be an architectural masterpiece. Construction began in 1994 involving 3,000 companies and contractors, 250 designers and 3,500 workers. The brainchild of architect Tom Wright, Burj Al Arab opened in 1999 to worldwide acclaim, and it’s still going strong. The 321-meter-tall colossus features 202 duplex suites, making it the tallest all-suite hotel in the world. Included: eight restaurants and bars, 24-hour butler service, helicopter transfers (yes, it has its own helipad), a fleet of Rolls Royces, two event facilities (including the stylish Al Falak Ballroom), a spa and health club, an amphitheatre, a library, an open-air swimming pool (complete with a swim-in pool bar), a private beach, three aquariums, and a 12-acre Arabian-themed water park. Its suites range from 170 to 780 square meters, each with a rain shower, a Jacuzzi, a 42” plasma screen, your own business desk with a laptop, a scanner and free Wi-Fi, an electronic control system to tinker with, a 24-hour dining menu, a minimum of 14 phones and a pillow menu with 17 selections. 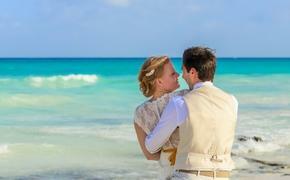 And the hotel boasts a staff of 1,600 (an eight-to-one staff-to-guest ratio). As if arriving in a helicopter or a Rolls Royce wasn’t enough, the entrance features four towers that propel fireballs into the air, complementing a 20,000-liter fountain to create an extraordinary visual display. And its fireworks display for New Year’s lasted 18 minutes. Once you get into the hotel, the interior design boasts 30 different kinds of marble (about 24,000 square meters), nearly 1,800 square meters of 24-carat gold leaf, and more than 43,000 square meters of glass. Oh, and did I mention? Burj Al Arab is located on its own private island 280 meters off the shores of Dubai, supported by 250 columns that go 45 meters under the Arabian Gulf. Burj Al Arab just recently announced a five-star children’s program called Spoilt Rotten. Kids get private butler service, private pool access, private beach access, and in-suite entertainment including Xboxes, Playstations and 24-carat gold iPads. The Dubai-based luxury property also unveiled its “Wedding in the Skies” package in May, which is just what it sounds like: you can get married 212 meters up in the sky on Burj Al Arab’s helipad. Arrive by air in an Italian twin engine Augusta 109 or by road in a Rolls Royce Phantom; participate in private tasting sessions with Burj Al Arab’s award-winning Executive Chef Maxime Luvara; have private sessions with celebrity personal trainers at Talise Spa; take private lessons in etiquette and dance; be treated to a wide range of consultations, shopping and styling sessions; and enjoy exclusive access to top jewelers, couturiers and fashion brands. This continues Burj Al Arab’s focus on making its helipad more than just a helipad. In 2004, Tiger Woods teed off from the platform. In 2005, Roger Federer and Andre Agassi played a tennis match there. 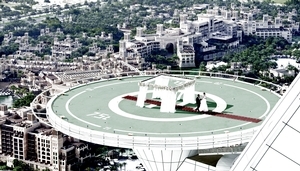 In 2011, Rory McIlroy sunk a hole-in-one from the helipad. And Formula One champion David Coulthard performed donuts in a Red Bull racing car last year. Pera Palace Hotel Jumeirah is located in the district of Pera, the cultural and social center of Istanbul. The hotel was designed with Art Nouveau, Oriental and Neoclassic styles by architect Alexander Vallaury, featuring 115 rooms (including 16 suites) complete with hand-woven carpets, special fabrics and artworks, and marble bathrooms. Most of the rooms and suites include individual balconies, as well. Pera Palace Hotel Jumeirah includes five restaurants and bars; a variety of event facilities from the Grand Pera Ballroom to the newly built Galata Room; a 380-square-meter spa with a steam room, a Jacuzzi, a sauna and a fully equipped gym; a library; and free Wi-Fi. Services include 24-hour in-room dining, shoe shining, a concierge service, dry cleaning and airport transfers with classic cars. The popular property is as much a historical landmark as it is a hotel. It was the first international hotel in Istanbul, as well as the first to hold an international fashion show and an exhibition show in the Turkish city. Numerous royalty, celebrities, politicians and writers have stayed at the location throughout the years, including Agatha Christie, Ernest Hemingway, King Edward VIII, Emperor Franz Joseph, Greta Garbo, Pierre Loti, Celal Bayar, Liam Neeson, Matt Dillon, and Ben Affleck. The biggest challenge for the hotel has been to implement new technology (like iDocks and electronically controlled curtains) while still retaining its core historical elements. Timer and Pera Palace work within a blueprint that includes the ideals of “value,” “culture,” “experience,” and “unique.” Timer described it as a boutique hotel where you can “travel back in time” and have experiences you can’t have anywhere else. Pera Palace recently completed a renovation of its lobby, Kubbeli Saloon tea lounge and library under the direction of world-renowned Anouska Hempel. The lobby features more light, wider spaces and improved seating areas, and the new additions sparkle with red, black and gold colors. This follows the grand-scale restoration project that took place from 2008 to 2010. If you’re looking for a truly unique property, Pera Palace certain fits the bill. It also doesn’t hurt that Istanbul was named the top destination in the world in the 2014 TripAdvisor readers’ survey. 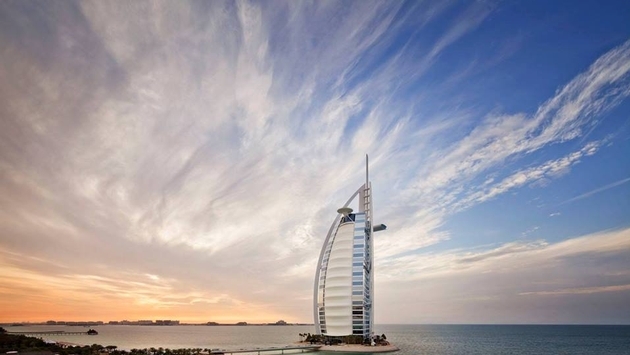 For more information on Burj Al Arab, go here. For more information on Pera Palace Hotel Jumeirah, go here.